hundreds of pages of original documents, maps and research information. Easy navigation. The Valley of the Shadow -hypermedia archive of thousands of sources for the period before, during, and after the Civil War for Augusta County, Virginia, and Franklin County, Pennsylvania. Those sources include newspapers, letters, diaries, photographs, maps, church records, population census, agricultural census, and military records. Students can explore the conflict and write their own histories, or reconstruct the life stories of women, African Americans, farmers, politicians, soldiers, and families. The project is intended for secondary schools, community colleges, libraries, and universities. Civil War.com CivilWar.com is divided into 11 sections and the overview section offers causes of the war, a summary of the war, a look at the life of a soldier and the timeline of events. Other sections include Battles, Resources, Weapons, Travel, News, For Teachers, Forum, People, and Slavery. Content is as deep as some other sites, but Resources section is for more in-depth study provides access to books, recorded histories, the Official Record, photographs, letters, diaries, links, genealogical information, statistics and government records. Crisis at Fort Sumter is an interactive historical simulation and decision making program. Using text, images, and sound, it reconstructs the dilemmas of policy formation and decision making in the period between Abraham Lincoln's election in in November 1860 and the battle of Fort Sumter in April 1861. This Civil War.com lesson plan helps students understand the historical context and significance of Lincoln's inaugural address through archival documents such as campaign posters, sheet music, vintage photographs and documents. Features EDSITEment-reviewed sites and six suggested activities. Read the timeline of the Civil War. *Use the timeline to fill in your Civil War timeline page. You are going to be making another newspaper. There is a link on the page to a template in Word that you can use. You can also design the newspaper yourself. Write down your who, what, where, when, why and how facts as you research your article choices. Instead of the facts, this time write a second article on another person from the war. For your free choice you could do anything appropriate to the time period, even an advertisement, or proverb or witticism. Here are some short directions for how to write a news article. Get started today. You must be finished by Day 165. You have 10 days to write 4 articles, include pictures, quotes and your free choice. Here’s one site to read about Clara Barton, a woman involved in the war. Here are sites with quotations. Here is a site for information on people. Here is a page to read about many of the battles. Here are sites on the battle of Gettysburg. You are going to be putting together a Civil War lapbook. Complete the slavery pieces. *Slavery and the Road to War – Look at this map. Click on Slave Population. Where were all the slaves? Click on Agriculture (that means farming). Where were all the farms? The South needed slaves to work their farms. Without slaves they couldn’t produce as much cheaply and couldn’t make as much profit (money). *(Print page 1.) 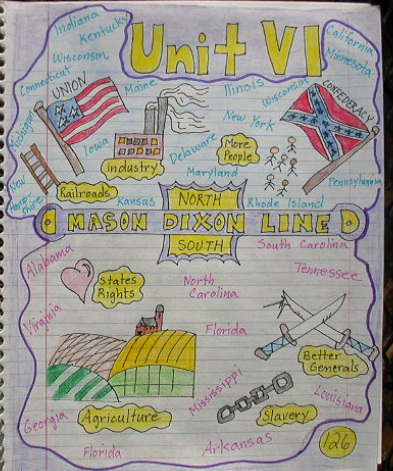 Color in a Union/Confederate map (American Civil War – Color the states). Today complete the Abraham Lincoln pieces. Read about differences between the North and South. Read about the South after Lincoln’s election. Read about the leaders during the Civil War. Tell someone about the two generals and two presidents you read about. Read about the Emancipation Proclamation. Read about the Gettysburg Address. Look at this page of battles. *Complete the lapbook piece (Clara Barton). Other people of the war: read this page, complete this piece *(Matthew Brady). Who were Sherman and Jackson? Day 165 is the last day to work on your newspaper. *Print out this fill in the blank activity. You can add this to your portfolio. Read this newspaper overview of the war. (*)Print out this fill in the blank activity, or fill in the answers out loud to someone. Read this page about the Civil War. Listen to the Gettysburg Address. Add the Civil War to your timeline. You are going to be doing a final, end-of-the-year project. You can choose to learn more about anything from history from the first to settle in America up through the Civil War. Once you have chosen what you are going to do for an end-of-the-year project, the second step is to decide what type of project are you going to do. You can make a lapbook, a poster, a power point presentation, a glog, or a scrapbook either on paper or online. You could write and put on a play or give a speech. Or, you can think of something I haven’t thought of. Choose what you are going to do. You must present your project on Day 180.